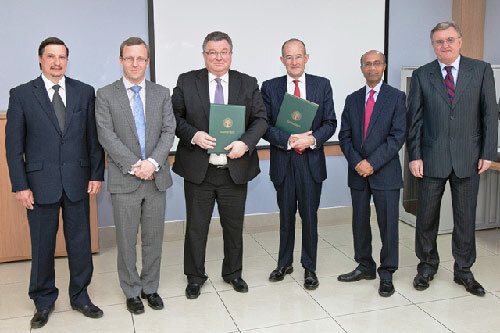 The Vice-Chancellor, Professor Paul Curran and the Deputy Dean of the School of Engineering & Mathematical Sciences, Professor Sanowar Khan, visited St Petersburg State Polytechnic University (SPSPU) in Russia in early April as part of the continuing collaborative partnership aiming to build closer ties between the two universities. Professor Curran and Professor Khan were guests of SPSPU's Rector, Professor Andrey Rudskoy. SPSPU is one of City's strategic partners and a member of the World Cities World Class (WC2) international network of leading universities launched by City University London in 2010. One of the main highlights of the visit was the signing of a new co-operation agreement between City and SPSPU, in the presence of HM Consul General in Russia Gareth Ward. The agreement reaffirmed City's and SPSPU's commitment to strengthen and widen their long-term collaborative partnership in the development and implementation of joint educational programmes, joint research and student and staff mobility. In previous years the School of Engineering & Mathematical Sciences secured over £150,000 for BRIDGE (British Degrees in Russia) projects under Prime Minister's Initiative 1 (PMI) funded by the Government's Department for Innovation and Skills and managed by the British Council. City has long-standing links with Russia. The first agreement of collaboration with SPSPU was signed in 1994 and subsequent agreements signed in 2005 and 2006 covered collaboration in both education and research. The dual-award, full-time MSc programme in Computer and Information Engineering developed under one of the above BRIDGE projects is now in its fourth year. There are over 100 Russian students at City, one of the largest groups of Russian students at UK universities.